Accurate colours and markings; impeccible research; five varied and interesting markings; excellent donor kit; high quality instructions; perfect register; thinly printed. 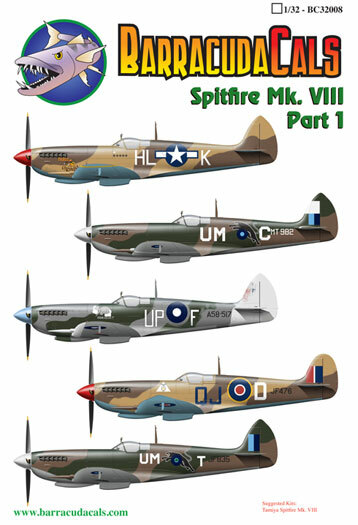 Barracudacals has released a set of five alternative markings for Tamiya's new 1/32 scale Spitfire VIII. The markings are colourful and varied - ideal for customising the excellent Tamiya kit. The two decal sheets are perfectly printed by Cartograf. Markings are in register, and the colours look very accurate. The instructions include high quality full colour illustrations and information on each subject. 308th Fighter Squadron, 31st Fighter Group, 15th Air Force, USAAF. Pilot - CO of 308th FS. Flown by Lt. Leland P. Molland. Castel Volturno, Italy. February, 1944. Molland was a 10.5 victory ace, 5 of those while flying the Spitfire. Finished in Dark Earth and Middle Stone over Azure Blue. All demarcations are tightly hand sprayed. Finish is worn and matt, with moderate exhaust staining and heavy wear on the wingroots. Note the yellow stripes on the outer wings. Spinner red. Blades black with 4” yellow tips. Wheel hubs Dark Earth or possibly dirty Aluminum. 152 Squadron RAF. SEAC. Flown by Warrant Officer Eric Clegg. Sinthe Airstrip, Burma, 1945. 152 Sqdn alternated between ground support missions and escorting transports in Burma. Finished in Dark Green and Dark Earth tight soft-edged uppersurface camo over Medium Sea Grey. Spinner in white with yellow tipped black prop blades. White theatre bands on wing, stabilizers and fin. 79 Squadron RAAF. Flown by Flt. Lt. Norman Turnbull (surname legally changed in August to Smithells). Based at Morotai, Indonesia. Late Spring, 1945. Finished in a factory painted scheme of Dark Green and Ocean Grey over Medium Sea Grey. Shown before incorrectly in other upper surface camo colors. Note tail unit and wing leading edges painted in very worn white paint. Pilot stated that the Elephant was painted grey. Yellow leading edges showing through the badly chipped paint. Standard roundels overpainted in camo colors. Spinner in light blue, not green. Note Sky band completely painted out in OG. 92 Squadron RAF. Desert Air Force. Pilot unknown. Based at Taranto, Italy. September, 1943. Finished in Dark Earth and Middle Stone over Azure Blue. All demarcations are tightly hand sprayed. Finish is relatively clean, with light exhaust staining and some wear on the wingroots. Note no yellow leading edge stripes on wings. Spinner red. Blades black with 4” yellow tips. Wheel hubs probably Azure or Dark Earth. 152 Squadron RAF. SEAC. Flown by Flying Officer Paul “Gus” Ardeline. Sinthe Airstrip, Burma, 1945. Ardeline, a Canadian, shot down a Dinah on 24th September 1944 while flying this aircraft. Finished in a Dark Green and Dark Earth tight soft-edged uppersurface camo over Medium Sea Grey. Spinner in white with yellow tipped black prop blades. Note green maple leaf on fuselage roundels and lack of white theatre bands. Very heavily weathered with prominent lead deposit staining from exhausts. A full set of stencil markings is also included. This is an excellent release covering five interesting and varied Spitfire Mk.VIIIs. BarrcudaCals' latest release will be the perfect finishing touch for a unique 1/32 scale Tamiya Spifire Mk.VIII.